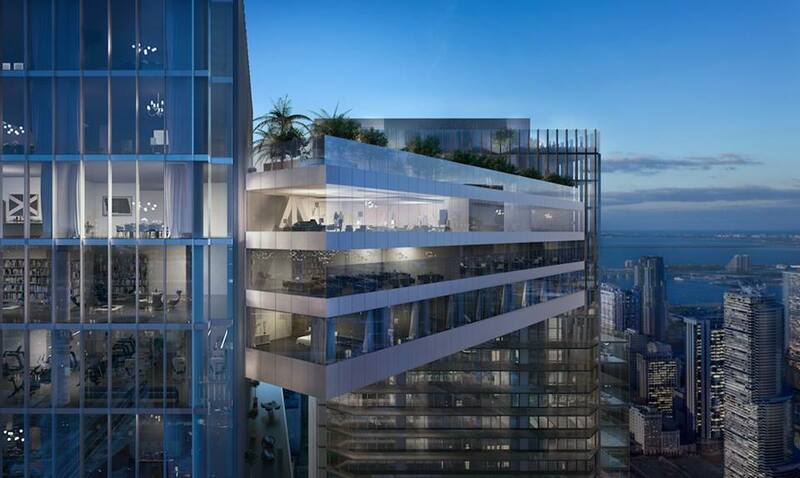 The developer of One River Point is modifying plans for the project, according to broker Michael Light. Buyers of units in the east tower of the project will now be permitted to rent their units on a monthly basis (the west tower will have a six month restriction). In addition, the total unit count is increasing by 32 units to 418, with the east tower now proposed to have 224 units and the west tower 194 units. Reservations are now going to contract, and a new sales gallery is scheduled to open next month. Groundbreaking has been pushed back to the 4th quarter of 2017.
this is such a beautiful development… are the extra units a good or bad sign? Plenty of willing investors though… so might increase the odds of being built. Also increases the odds of the building being an unlivable mess littered with short-term tenants who respect nothing and destroy everything. Anyway unless your planning on being an full-time owner-occupier (pretty rare in miami condos), who cares? This will be an amazing building! monthly rentals will be attracting some tourists and business people to the area. doing more units means that the units will be smaller, closer to hotel rooms sizes. Taste of Singapore in Miami. Something tells me you have never been to Singapore. Marina Bay Sands is an ugly eyesore, and only known for its infinity pool and adjacent fake ugly trees. Miami is actually proposing to rip those off as well along Biscayne Boulevard. If you want to emulate urbanism in Singapore which actually works, look at the CBD from the past twenty-five years, and zero-tolerance policies on vandalism and littering. Not compatible with monthly rentals!! Give me a break already on this project. So tired of reading articles about it when the chances of it getting built are slim to none. 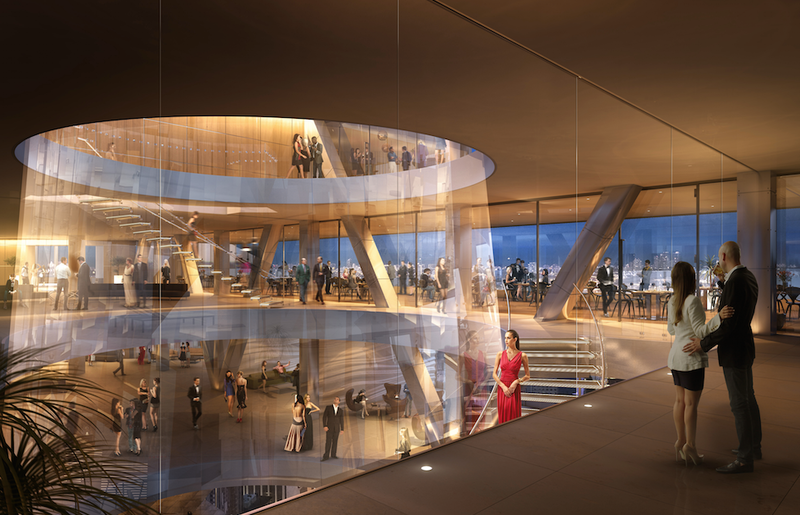 Based on what I am seeing on the design – the building has to be built in one phase due to the connection of the two towers – a total amatuer move because at least 200+ units have to go into contract to even think about getting any type of construction loan. At least with phased construction the towers could be built as they sell. Even if construction started today it would be probably three years before delivery. On top of that the project has been on the market for not one, not two but close to three years so changing the rental policies when the rest of brickell and downtown buildings are basically rental buildings with foreign investors is another amatuer move. Super luxe buyers don’t want transient use – maybe on the beach but definitely not in oversaturated, oversupplied rental market like brickell/downtown. Seriously, fire whoever gave this advice. Probably the realtors selling it. Not the good kind. That’s for sure. Viñoly is known for this style. It will be an honor to have one of his design s in Miami. I wonder if this means a new design is in the works. Viñoly can do far better. 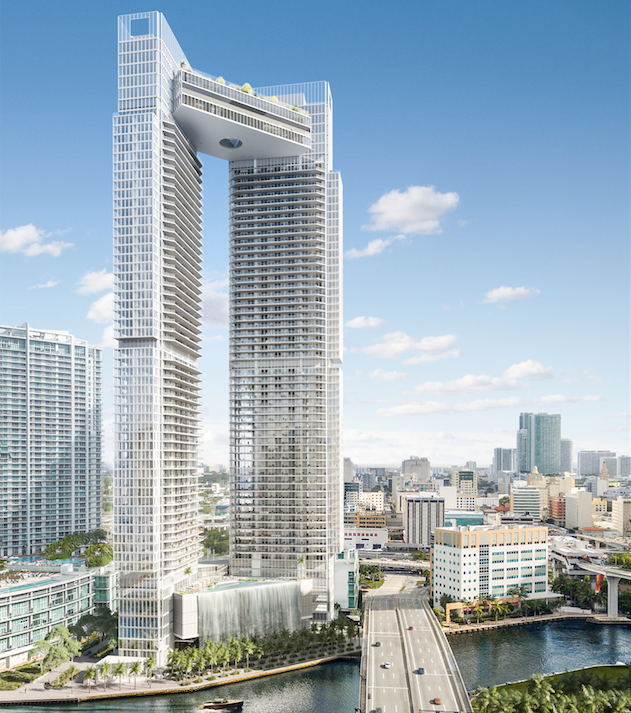 The current proposal is too boxy and suffers from the same flaws as Icon Brickell, with units looking into each other and frankly contributing very little to the potential activity along the river, using a fake waterfall as a deceptive gimmick instead. Would you be okay with a real waterfall? Sure smartass, although some terraces for retail and restaurants with outdoor seating is more realistic.